Whether you like to tee it up with the mowers or wait till the cows come home, at Poplar Ridge you’ll enjoy exceptional scenery with beautiful sunrises and spectacular sunsets to frame your days. Nature was our guide when designing our course and we allowed the landscape and natural contours of the rolling hills and meadows to dictate where we placed our holes and lots to take maximum advantage of the magnificent views. 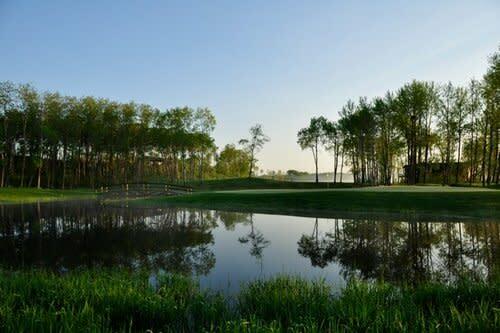 The course located just 1/2 mile south of beautiful Riding Mountain National Park in Manitoba, plays 6,642 yards from the back tees but there is ample opportunity to enjoy your game from two shorter sets of tees. The course contains a well-balanced mixture of open links style and wooded parkland holes. There are lots of changes in elevation and abundant water and wildlife to both enhance your experience and test your skills. You’ll find the course in excellent condition, as is our extensive practice facility, complete with range, short game area and putting green, on which to hone your skills. While our fully stocked pro shop is your golfing HQ, for everything from fairway fashions to game improving lessons.